In 1945 on the outskirts of Salzburg, victorious American soldiers capture a train filled with unspeakable riches: piles of fine gold watches; mountains of fur coats; crates filled with wedding rings, silver picture frames, family heirlooms, and Shabbat candlesticks passed down through generations. Jack Wiseman, a tough, smart New York Jew, is the lieutenant charged with guarding this treasure—a responsibility that grows more complicated when he meets Ilona, a fierce, beautiful Hungarian who has lost everything in the ravages of the Holocaust. Seventy years later, amid the shadowy world of art dealers who profit off the sins of previous generations, Jack gives a necklace to his granddaughter, Natalie Stein, and charges her with searching for an unknown woman—a woman whose portrait and fate come to haunt Natalie, a woman whose secret may help Natalie to understand the guilt her grandfather will take to his grave and to find a way out of the mess she has made of her own life. A story of brilliantly drawn characters—a suave and shady art historian, a delusive and infatuated Freudian, a family of singing circus dwarfs fallen into the clutches of Josef Mengele, and desperate lovers facing choices that will tear them apart—Love and Treasure is Ayelet Waldman’s finest novel to date: a sad, funny, richly detailed work that poses hard questions about the value of precious things in a time when life itself has no value, and about the slenderest of chains that can bind us to the griefs and passions of the past. 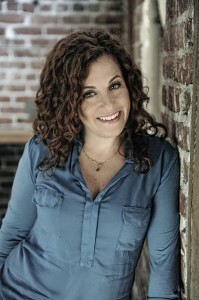 Ayelet Waldman is the author of the recently released Love and Treasure (Knopf, April 2014), Red Hook Road and The New York Times bestseller Bad Mother: A Chronicle of Maternal Crimes, Minor Calamities and Occasional Moments of Grace. Her novel Love and Other Impossible Pursuits was adapted into a film called “The Other Woman” starring Natalie Portman. Her personal essays and profiles of such public figures as Hillary Clinton have been published in a wide variety of newspapers and magazines, including The New York Times, Vogue, The Washington Post, and The Wall Street Journal. Her radio commentaries have appeared on “All Things Considered” and “The California Report.” Her books are published throughout the world, in countries as disparate as England and Thailand, the Netherlands and China, Russia and Israel, South Korea and Italy. 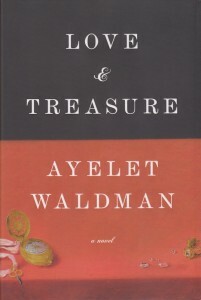 You wouldn’t think that a novel that spends fully half it’s pages dealing with the immediate aftermath of the Holocaust could be magical and amazing, but Ayelet Waldman’s Love & Treasure manages to be so. To be clear, those magical moments come between a lot of candid, even gritty, scenes. The first half of the book is the story of Jack Wiseman, an ethnic Jew and American soldier, in Europe at the end of World War II. Largely due to circumstance he is put in charge of a warehouse which holds the contents of a train, which, in turn, was full of the stolen, stripped down belongings – everything from ceramics to jewelry to bed linens to art – of Hungarian Jews who were either sent to concentration camps or sent to forced labor camps by the Nazis. The problem is that Natalie’s story, which I referred to as the second ‘half,’ ends in such a way that it feels like an ending, but there’s a third part of the story, the history of the necklace’s original owner. Don’t get me wrong, I loved learning the story of the necklace, loved a glimpse into early twentieth century feminism in Europe, it just felt like the novel would have been even more magical and amazing than it already is if Jack had been part one, Natalie had been part two, and the rest had been woven through in bits and glimpses. But that’s me, who sometimes likes books to be ideally structured even though life never actually is, and the reality is that this minor structural issue didn’t detract from the story in any way. Jack’s section is heartbreaking, Natalie’s is a grand adventure, and all the rest? Quiet magic and amazing history. Is this a beach read? Maybe not. But it’s a great book for a lazy summer Sunday. Goes well with: Organic eggs scrambled with spinach, salmon and cream cheese, a toasted bagel with butter, and a few chunks of really ripe cantaloupe.